"The book delivers on its promise of intimacy in its depictions of Sotomayor's family, the corner of Puerto Rican immigrant New York where she was raised and the link she feels to the island where she spent childhood summers …This is a woman who knows where she comes from and has the force to bring you there. Sotomayor does this by being cleareyed about the flaws of the adults who raised her—she lets them be complicated…'I've spent my whole life learning how to do things that were hard for me,' Sotomayor tells an acquaintance when he asks whether becoming a judge will be difficult for her. Yes, she has. And by the time you close My Beloved World, you understand how she has mastered judging, too." "With buoyant humor and thoughtful candor, she recounts her rise from a crime-infested neighborhood in the South Bronx to the nation's highest court. 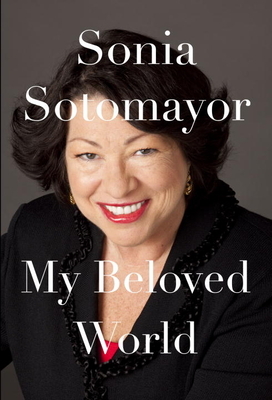 'I will be judged as a human being by what readers find here,' Sotomayor writes. We, the jury in this case, find her irresistible." "Sotomayor turns out to be a writer of depth and literary flair…My Beloved World is steeped in vivid memories of New York City, and it is an exceptionally frank account of the challenges that she faced during her ascent from a public housing project to the court's marble palace on First Street." "You'll see in Sotomayor a surprising wealth of candor, wit, and affection. No topic is off limits, not her diabetes, her father's death, her divorce, or her cousin's death from AIDS. Put the kettle on, reader, it's time for some real talk with Titi Sonia…The author shines in her passages on childhood, family, and self-discovery. Her magical portraits of loved ones bring to mind Sandra Cisneros's The House on Mango Street; both authors bring a sense of childlike wonder and empathy to a world rarely seen in books, a Latin-American and womancentric world." "Big-hearted…A powerful defense of empathy…She has spent her life imagining her way into the hearts of everyone around her…Anyone wondering how a child raised in public housing, without speaking English, by an alcoholic father and a largely absent mother could become the first Latina on the Supreme Court will find the answer in these pages. It didn't take just a village: It took a country." "Remarkable…A portrait of a genuinely interesting person." "In a refreshing conversational style, Sotomayor tells her fascinating life story with the hope of providing “comfort, perhaps even inspiration” to others, particularly children, who face hard times. “People who live in difficult circumstances,” Sotomayor writes in her preface, “need to know that happy endings are possible." "Classic Sotomayor: intelligent, gregarious and at times disarmingly personal…A portrait of an underprivileged but brilliant young woman who makes her way into the American elite and does her best to reform it from the inside…I certainly hope My Beloved World inspires readers to chase their dreams."